New England Summer Camps offer a lifetime of memories and exceptional experiences. Visit the NE Summer Camp information below to help locate the ideal Summer Camp for your child. To feature your exceptional New England Summer Camp, contact us. Vermont Summer Camps serve children from all over the world. T hey offer a wide variety of learning programs, facilities, staffing, and outstanding opportunities to develop new skills, make new friends, build character and experience the quality of life in Vermont. Find Vermont Day Camps, Adventure Camps and Vermont Summer Camps for every interest. Find more Vermont Summer Camps from VT LIVING.com. Outdoor Adventure camps and trips for kids ages 5-17. Offered in day and week-long formats. Activities include rock climbing, mountain biking, paddling, swimming, caving, hiking, overnight camping, and much more. Professional, certified guides on staff. A unique primitive summer camp for boys, ages 10 -14. Boys develop an authentic sense of personal accomplishment and learn to rely on their own ingenuity as they live in tipis, learn wilderness skills, canoe, hike, throw tomahawks and atlatls, cook over an open fire and so much more! Through community living and group decision making, campers learn to work and play together in a spirit of cooperation rather than competition. Accredited by the American Camp Association. Girls Ages 8 - 17 - You're invited to spend an action-packed week (or two or more!) with us this summer at American Dance Training Camp's ULTIMATE Green Mountains dance camp in Stratton, Vermont. Come make new friends and have a blast learning the latest contemporary, jazz and hip hop dance moves from America's greatest dance choreographers. Dancers of all levels - absolute beginners through experienced performers - are welcome at ADTC. Join us for a fun-filled week you'll never forget. We hope to see you this summer! The Windridge Experience is unique among children's summer camps. We incorporate highly specialized tennis, soccer and horseback riding programs within the traditional framework of a rural New England camp setting. Windridge also offers many elective programs such as swimming, golf, mountain biking, archery, ropes course, basketball, volleyball, arts & crafts and more. Brown Ledge is a residential girls camp on Lake Champlain near Burlington, Vermont with four and eight week summer sessions. For 78 years we have offered a unique elective activity program in horsemanship, theatre arts, water and field sports. Here campers may choose their own program throughout each day, without having to "sign-up." The School of Creative and Performing Arts (SOCAPA) offers summer arts intensives in filmmaking, acting, photography, and dance. Programs run from one to three weeks in length for teens ages 13 - 18. Our Vermont campus is hosted at Champlain College, on the shores of Lake Champlain in the hip and artistic city of Burlington. Novice and advanced students are dedicated to working hard and gaining the most they can from their program. Nowhere else will you find this level of creative intensity combined with this much fun! Rosie's Girls® was created by Vermont Works for Women in Winooski, VT. This unique summer program is for middle school girls in grades 6th through 8th grades. The camp builds strong, confident girls through exploration of STEM and Trades-related activities as vehicles for teaching self-efficacy, confidence and strength. New Hampshire summer camps serve children from all over the world with a wide variety of programs, facilities, staffing, and outstanding opportunities to develop new skills, make new friends, and experience the quality of life in New Hampshire. 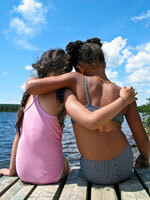 The New Hampshire Summer Camps Guide in NH Living has more information. Maine summer camps provide fun learning experiences including swimming, canoeing, fishing, camping, hiking, and other outdoor activities. Summer camps give our children the connection to nature they need to be healthy individuals as well as the knowledge of the environment and wildlife. Maine summer camps attract children from all over the world. Trained camp counselors offer a wide variety of programs. The Summer Camp Guide in ME Living has more info.